I’m just a beginner in knitting and crochet, it’s been about a year since I started this wooly adventure. The projects I choose are more a spur of the moment thing. I read blogs, check pinterest and ravelry and I see pattern that I just HAVE to make regardless of the weather. Made from cotton and this would be a great summer project but I made it in Autumn, just because I liked it. 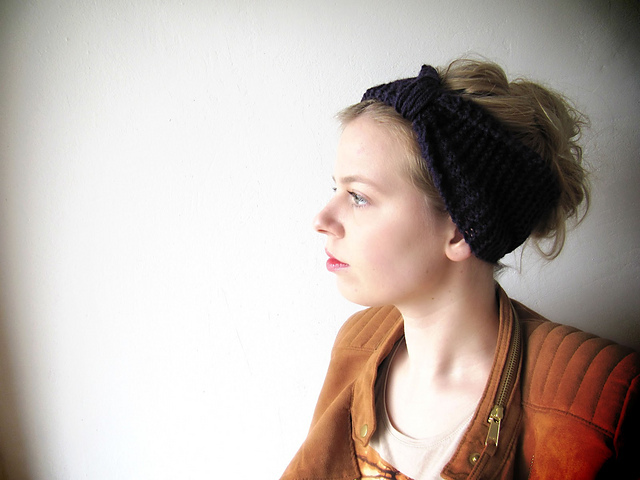 Of course I wouldn't have made this in summer, but projects purely inspired by the temperatures are pretty rare. I do look forward to knitting on the beach! Last summer we didn't go on vacation, we stayed in the Netherlands and the summer wasn't too great. No knitting/crochet on the beach and I grew up near it so I very much enjoy going to the beach (even when it rains). This year were going to Croatia! Projects I knit outdoor have to be small though, now big blankets and such. Only when the blanket can be made in individual parts. How about you? 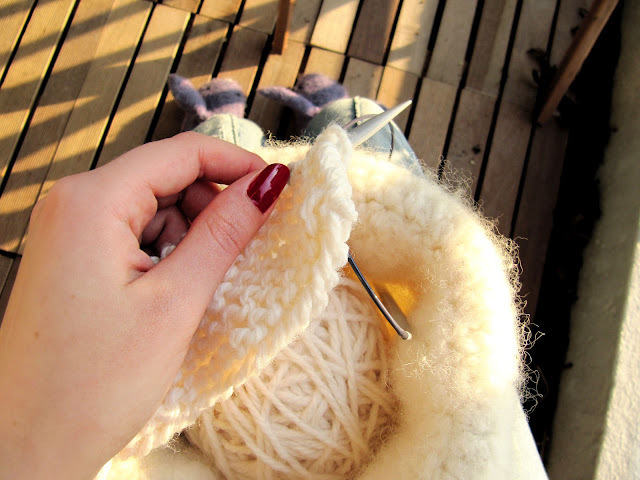 Where is your favorite outdoor knit/crochet place? And what kind of projects do you make? Your table runner is beautiful. Your place in the sun looks divine, lucky you, have fun. I've never crocheted/knit outdoors, except for those knit/crochet days..when we gather outside to work on projects. I prefer my same spot all the time, which is on my bed...Croatia is wonderful, but I've never visited the beaches there..
That table runner is fantastic. Great job! I like to knit at the park while the children run around. Enjoy Croatia! 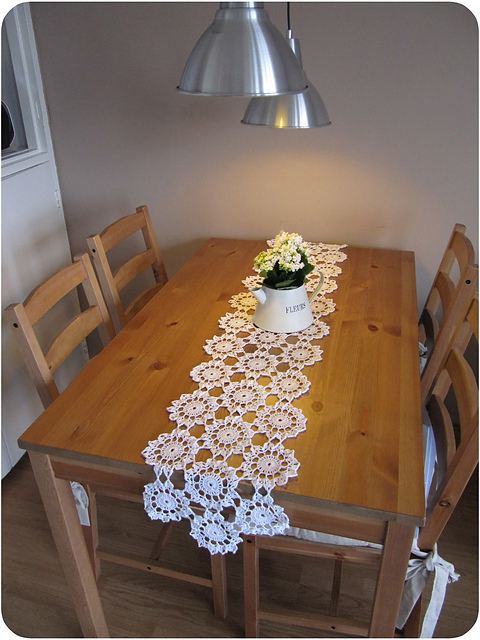 I love the table runner, it is very pretty! Also, the yarn you are using in that last photo looks fantastic. Yeah, knitting and crocheting in ALL Seasons!!! I fell in love with your table runner. You have inspired me to make one. Could you fit me in your luggage too? (kidding!!) Croatia looks amazing. Have a wonderful trip! I'm like you, I totally go with whatever takes my fancy, unless it's close to Christmas and then I go into overdrive crocheting like a mad person. I'm not sure I would ever be a seasonal crafter, but then the weather isn't particularly extreme either, so that's probably why. You're right ... I love to knit outdoors in all types of weather. Well, no, not when it's raining but give me a cold, brisk day and I'm happily knitting away. How wonderful to drive to Croatia!! Also, I lived in Belgium for 4 years and absolutely loved the Netherlands! I went often with my father to see the tulips and eat frites :-) I'm so jealous you get to live there. Enjoy! That table runner is amazing - it looks like an heirloom piece. I can't believe you haven't been knitting and crocheting that long! And your vacation will be so much fun, I'm sure. I haven't been to Croatia, but I have friends who have gone, and they've loved it. For a beginner you make beautiful and well made things. Have fun on the beach! Ok, I'm a member now! I love your blog!!! thanks to eskimimimakes! The table runner is lovely and would be a great summer project. I love the headband! Croatia looks like a beautiful vacation destination. You have such amazing style! Ooh, iedere dag een berichtje! Heb een fijn weekend, Suzanne, en een mooie Koninginnedag! Thanks, jij ook een super weekend en een fijne koninginnedag!